Skulls and Bacon: Bacon Floss !!! Not only am I happy because it's Friday, but also because the people over at Archie McPhee are genius. 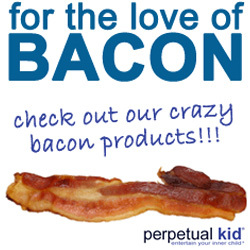 The consistently come out with awesome bacon novelties that just can't be beat. The newest in the line is Bacon Dental Floss. That's right, now you can improve your dental hygiene while enjoying the amazing flavor of crispy fried bacon. As soon as I get my hands on this I'll let you know how it is. The bacon mints are not my favorite but the bacon toothpicks were a real winner and I expect the floss to be as well. Wonderful product. I'll recommend it to my dentist.